I am a professional musician. I have a bachelor's degree in music with an emphasis in voice. My college days were spent in practice labs, singing a minimum of three hours each day. 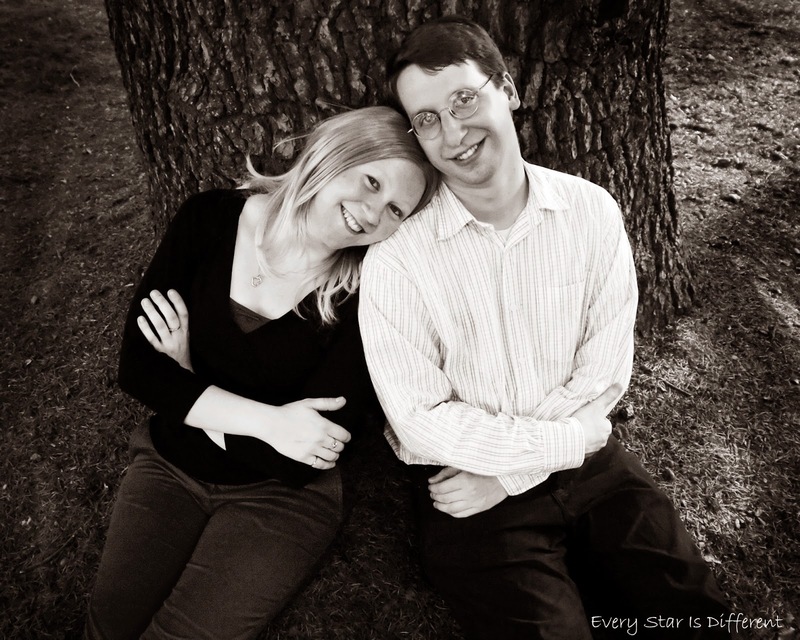 Favorite vocal composers include Mozart, Brahms, Barber and Ives. My favorite language to sing is German. Italian is a close second. I also play the piano. Before children, I had my own music studio and taught private vocal and piano lessons. It is my hope that I can further my music education in the future by studying musicology and choral conducting. Nothing gives me more of a natural high than conducting a large choir. One would think that with all of my education and experience, teaching music to my children would come easy to me. The opposite is true. It's hard to teach something that comes so natural to me, yet is so foreign to them. I forget sometimes to break down the material into the simplest terms, because I don't think about all of music's parts individually anymore. The three kiddos have been dabbling with piano lessons for two years now. Dinomite and Princess can play simple songs, using a C Major five finger scale, while reading notes on a grand staff as they play. Bulldozer struggles to read notes, but does well playing what he hears. This year piano lessons will be more formal. Practice will be part of their daily routine. Dinomite, Bulldozer, and Princess know how to read notes on a staff, when given a control. They know how to play through a piece of music. However, they struggle with pitch identification, rhythm, tempo, and dynamics. I've taught the concepts many times, but they still seem a bit foreign to them because they're just about music and playing the piano. 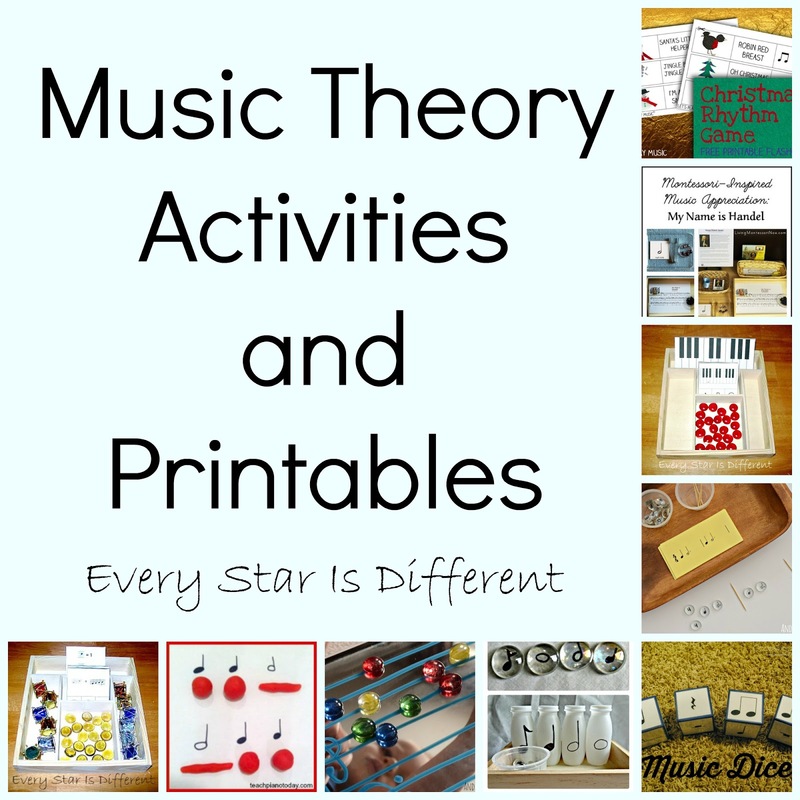 The activities in this post have been created to help the kiddos relate to music concepts in other ways, making them easier to understand. Sometimes thinking about music in other terms, is the best approach to take. Understanding signs in music can be a bit difficult for some. I decided to relate double bar lines and repeat signs to traffic lights. When you play through a piece of music and see a double bar line, it means it's time to stop. If you see a repeat sign, you continue to "go" or play. To help the kiddos visualize what to do, I've added a mini match box car, and am treating the line of music as if it's a track for the car to drive in. 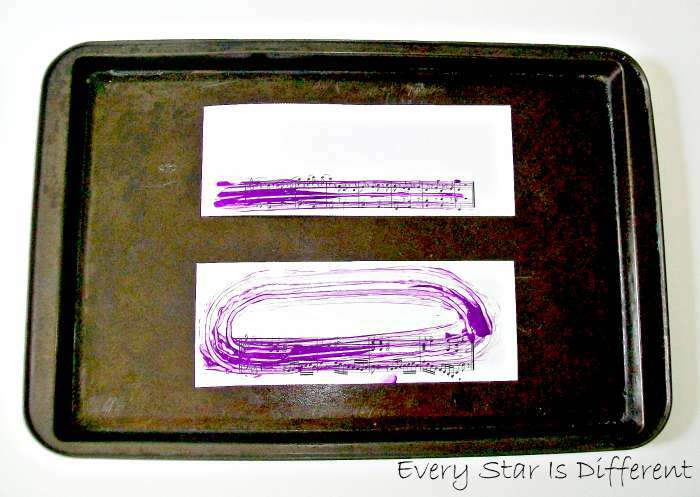 The kiddos dip the car in paint and drive across the line of music, depending on the final music notation, they'll either stop, or continue to drive back to the beginning of the piece, and repeat the "race" again. Kiddos may need to dip their car in paint several times along the way. Bar lines make great "pit stops." I had so much fun selecting sheet music for this activity. Because I am only teaching the concept of repeat signs and double bar lines, it doesn't matter how complicated the piece looks. 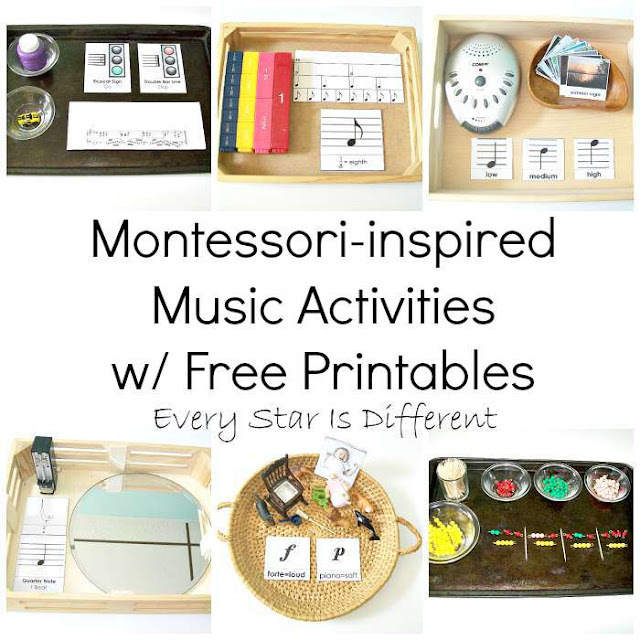 Source: I created the printable for this activity as part of my Montessori-inspired Music Activities Printable Pack 1. 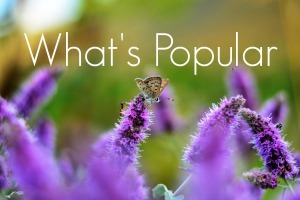 For your free copy, click on the link at the bottom of the post. 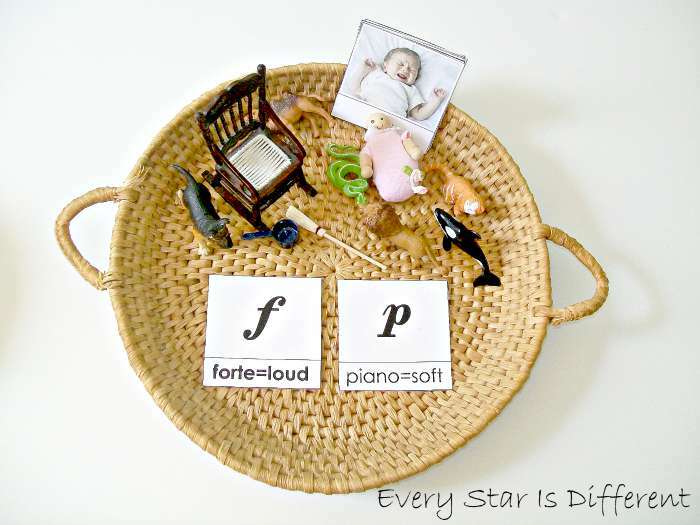 My kiddos know the difference between loud and soft, but to remember the words forte and piano, along with their symbols is a bit more difficult. Perhaps it's because they only see the words used in music. In this activity I apply the words to sounds outside of music. The kiddos will sort objects, placing them under the correct dynamic marking. Control cards are provided so they can check their work. Objects that make loud sounds have labels bold faced. Soft sounding objects are not bold faced. The cards can be used in place of objects if they aren't available. Source: I created the activity for this printable as part of my Montessori-inspired Music Activities Printable Pack 1. For your free copy, click on the link at the bottom of this post. Dinomite and Princess struggle with identifying pitches as low and high. Sometimes they confuse pitches with dynamics. Other times they mix up pitches, thinking low is high, and high is low. I've introduced bells to them, trying to help them understand the sequence of pitches, but they struggled A LOT. Bulldozer on the other hand did amazing and seems to have close to perfect pitch. 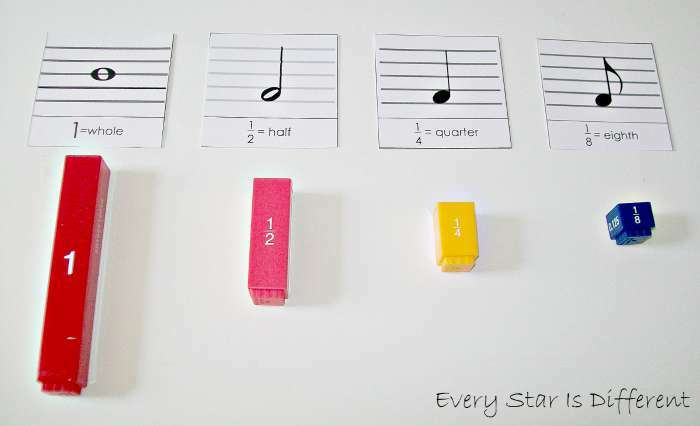 This activity is designed to encourage them to forget about the piano and bells. Instead they'll think and listen to various natural sounds and determine if they are low, medium or high. 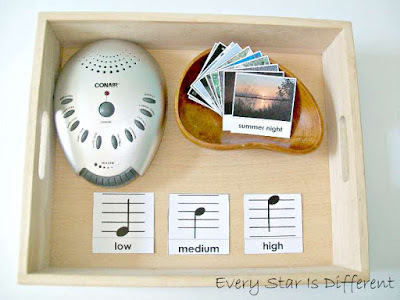 Once they remember the natural sound pitch labels, I'm hoping it will help them identify correct labels while playing various musical instruments. The kiddos will look at the cards and imagine the sounds they might hear in the pictures. They will listen to corresponding sounds on the Conair Sound Therapy Sound Machine as a control. Then they will place the picture cards under the correct label. We will do this together several times before they complete the activity on their own. The boys use the sound machine every night to help them sleep and love the various sounds. It is very easy to distinguish low versus high pitches on the machine. 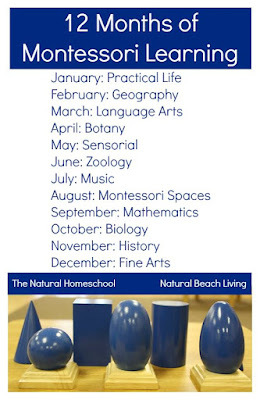 Source: I created the printable for this activity as part of my Montessori-inspired Music Activities Printable Pack 1. For your free copy, click on the link at the bottom of this post. My kiddos love watching conductors and have asked if I could teach them the skill. Without hesitation I graciously agreed. Conducting is a fantastic way to teach kiddos about rhythm and tempo. It involves movement of the body, listening skills, and provides a natural control, whether conducting a group of people, or trying to conduct using a metronome. In this activity the kiddos will learn the value of a quarter note as one beat. Using the Wittner 903014 Taktell Super-Mini Metronome, Black , they will practice conducting two beats per measure, then three beats, and finally four beats. The metronome allows them to conduct at various tempos, first slow, and then faster over time. A mirror is provided as a control for their movements. The kiddos are so excited to try this out. I was hoping to find a conducting baton that was their size to add to the tray, but none of our local music stores carry them anymore. Oh well. My kiddos may not understand note values, but they LOVE fractions. Why not apply math to music, to help them better understand things? This activity can be done in two ways. First, the kiddos will sequence note values from biggest to smallest, using the Learning Resources Fraction Tower Activity Set as a control. I'm hoping this will help them understand how each music note received it's name. Once the kiddos feel comfortable with their sequencing abilities, they'll create a note value chart with the fraction pieces. 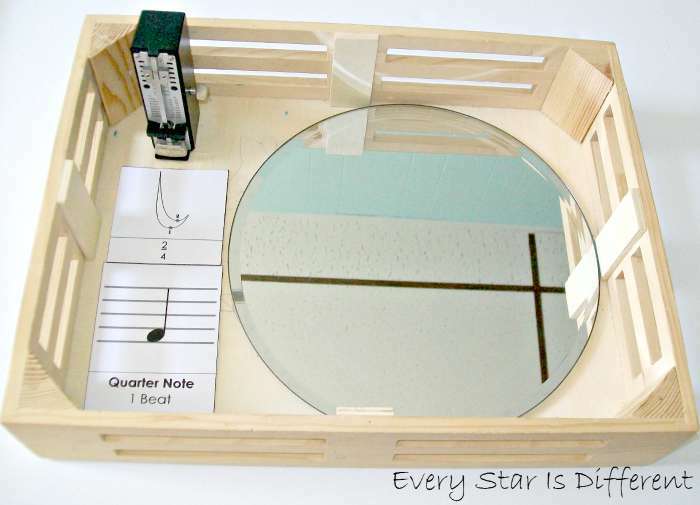 This will come in handy as they start to understand and analyze beats per measue in the future. 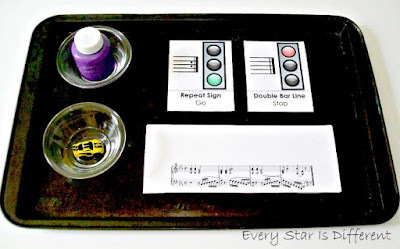 Source: I created the printable for this activity as part of my Montessori-inspired Music Activities Printable Pack 1. For your free copy, click on the link provided at the bottom of this post. 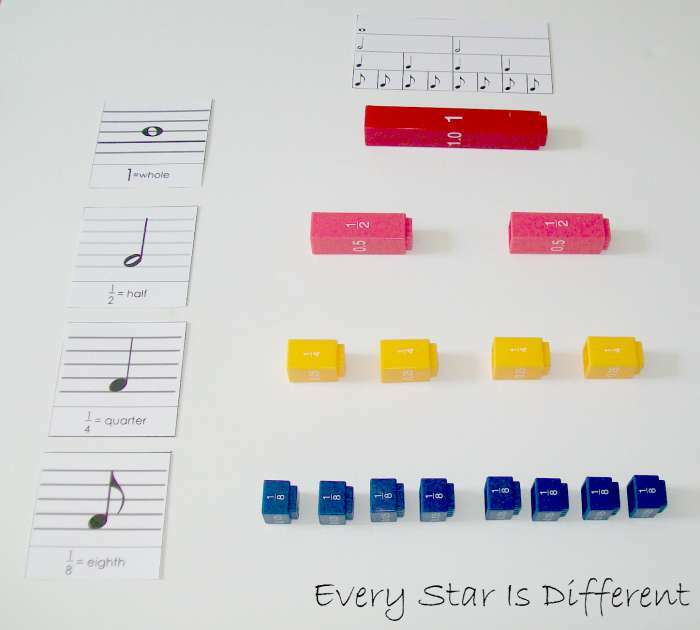 The kiddos may be a bit young to understand time signatures and how different note combinations can make up four beats in a measure, but they're not to young to come up with their own number combinations, especially when using Kid Advance Montessori Checker Board Beads . When choosing this activity, the kiddos will lay out several yellow bead bars representing the number four. Each bead bar represents one measure of music. They'll place a tooth pick in between each yellow bead bar to represent bar lines. 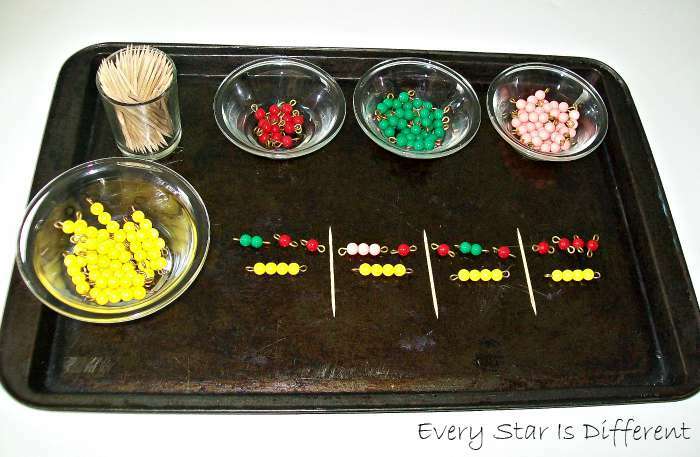 Then they'll create different bead bar combinations that add up to four, using the yellow bead bar as a control. Eventually they'll be ready to label and write rhythms they've created and play them on various percussion instruments. Music is a combination of all subjects. When students are struggling to understand specific musical terms at the piano, or while learning any other instrument, sometimes the best thing to do is to teach musical concepts in other terms, using different subject areas and interests. 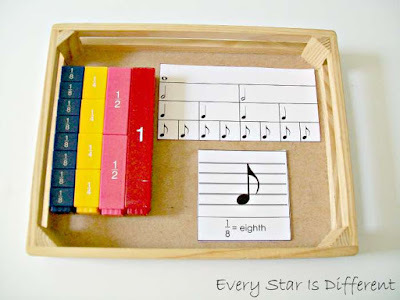 It not only will enhance their understanding, but will teach them that music is everywhere. 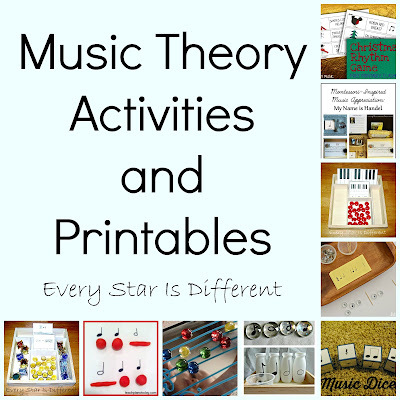 For other fun music theory ideas, be sure to check out my Music Theory Activities and Printables post! For more fabulous Montessori-inspired music activities and ideas take a look at posts included in the 12 Months of Montessori Learning Series. I never knew you were a professional musician! And I totally understand when you say the opposite is true when teaching kids music -- we forget to break it down for them because it comes so naturally for us. You've hit the nail for me so now I'll know what to keep in mind when we're ready to dive deeper into music education. Thanks for that and for the wonderful activities! Your first music activity is sensational! Wow. There are so many incredible activities here that I don't know where to begin. I love the way you brought math into the equation. And I never would have thought to introduce conducting to my children. This is definitely the work of a musician! I love all of your ideas! How creative! Wow! I'm officially sure your young children's knowledge of music surpasses mine! I could learn from these awesome activities. It's funny that you and I both struggle teaching music -- you know too much, I know nothing! Wonderful as always! Wow! I am also so impressed by this amazing music unit study! I learned a lot just reading this... :) I love how you made difficult musical components easy to understand and hands-on for learning. I will be back to use this as a resource! Thank you for putting together such an amazing post! This is a really great post! I never would have thought of these ideas, and you are right--it's hard to break things down to teach them when it comes naturally. Thanks! I love this ....I can't thank you enough for writing this!! My son loves anything music and I have been struggling to make things that would appeal to his interest. I will be defintely taking advantage of your great printables!